Welcome to the Soccer Program of the Forest Hills Youth Activities Association (FHYAA) official web site. Here you can get information about our leagues, teams, scores and game summaries. If you're a first time visitor, please take a few moments to view our site and sign our guestbook below (the kids really like to read your comments). All game scores are posted within 24-48 hours. Thank you for visiting and please come back soon. This web site is maintained by Coach Boris, daily updates will occur Sept 1, 2017 - Nov 11, 2017. 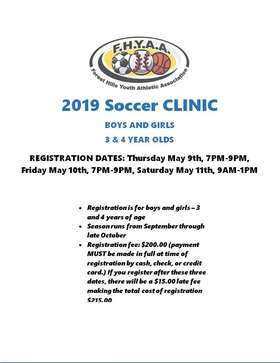 Please note the 2019 Soccer and Clinic Registration dates below. This may be the only time to register due to the popularity of our program and limited number of open spaces available. Additional registration information will be posted on the www.fhsl.org web site as soon as it's available. The FHYAA Soccer Program sells out every year, don't get shut out!! Please call 718-544-2296 (Mon-Fri 1P-5P) for additional information. We would like to thank all the volunteers, parents, players and league officials for another successful soccer season! 2018 Soccer Season Schedule is NOW AVAILABLE !! Luckily, only minor damage to Fleet Street Fields was caused by Hurricane Sandy on November 29th, 2012. We only lost a couple of trees with minor damage to a boundary fence on field 5 and some portable fencing that had blown over on several fields. Special thanks to Dexter and Bobby for getting the facilities back in shape so quickly. Click here to see pictures of the damage. The FHYAA hopes that you and your families have weathered the storm safely and look forward to seeing you at the fields soon. The Soccer Program of FHYAA would like to thank all of the local merchants and business' that have sponsored a team this season, the league and our youngsters greatly appreciate your generous contributions. Parents, please help support our community and sponsors. League Officials have asked that every player wear their league-issued uniform. Please make every effort to have your child at the field 20-30 minutes before each game to stretch with the team. If during the game your child needs to leave the field, please notify one of the coaches. Please make sure that your child's name or initials or written on their equipment (i.e water bottle, clothing...). Please feel free to ask any of the coaches for assistance or advice, we love to talk. If your child is unable to make a game or practice, please notify any coach within a reasonable amount of time. Because of you, our kids have a place to play! The FHYAA Soccer Program would like to take this opportunity to thank a parent, John O'Connell from O'Connell Construction for lending his equipment, expertise, energy and countless hours to help us restore our fields. To our facilities staff (Tom Brennan, Carl, Bobby and Dexter) for their leadership and to all of the players, families, coaches, league officials and community leaders for volunteering their time (to chainsaw fallen trees, sort & pile wood, rake leaves, remove broken fences, chip wood, pickup debris and transport equipment), you are truly amazing! 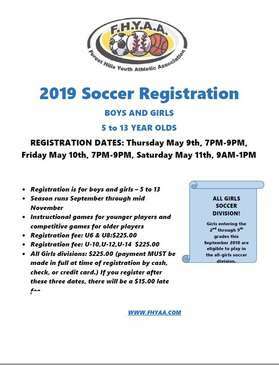 Because of our volunteers' and John's dedication to the league, we were able to resume our 2010 Soccer season quicker than anyone would have imagined and that is what makes our FHYAA programs and families so special. THANK YOU! Sorry if your name wasn't mentioned here but there are so many people to thank. Look for a complete article on the storm damage, challenges, accomplishments and acknowledgements coming soon. Please check out the recently added picture albums and video to see the amazing job our volunteers did in just three days. There will be an important meeting on Tues, Oct. 16 at 7 pm in the clubhouse. Topic: The older divisions will be discussing the playoffs that are coming up. The younger divisions will be going over the past season. Field 3 regular season games will NOT be made up! Field 1 All-Star games are moved to Sunday 10/28/2018 at the same time slots. Due to unplayable field conditions. ALL Fields are CLOSED today November 9! Registrant must appear in person with a parent or guardian who must present the registrant's birth certificate or certified record of date of birth. Payment of the registration fee MUST be made at registration and may be in exact cash, credit card or check made payable to FHYAA. SIGN UP NOW.... DON'T GET SHUTOUT.... DO NOT WAIT! Due to the large increase of enrollment that we had for the 2018 Baseball Season, this may be the only registration we have and will be forced to close out registration early for the 2019 season. Therefore, it is highly recommended that you register during this enrollment period to guarantee a spot for the 2019 season. Late registrations will be taken only up to the date of assessments only if space is available. Late registration fee will apply to all late registrants. Enrollment will be based on a first come, first served basis regardless of how many years you have played in the past. 14 visitors have signed our guestbook.